Gamechanging Reporting for bike shop E-Commerce websites. You waste time every month building reports with data that is suspect from the start. When you look at your reports inside google analytics you're not sure if you can rely on the data because you see that a huge percentage of your sales are coming from "referrals" and not attributed to your different marketing efforts. We'll fix your settings inside Google Analytics, and Google AdWords(if applicable), and recommend changes to your analytics tag implemention to ensure that you have clean properly attributed data. Your custom dashboard will give you insight into the current and the past 13 months worth of data that will help you quickly make decisions about your business. What if I'm not currently tracking anything? No Problem! Email [email protected] and get it set up. 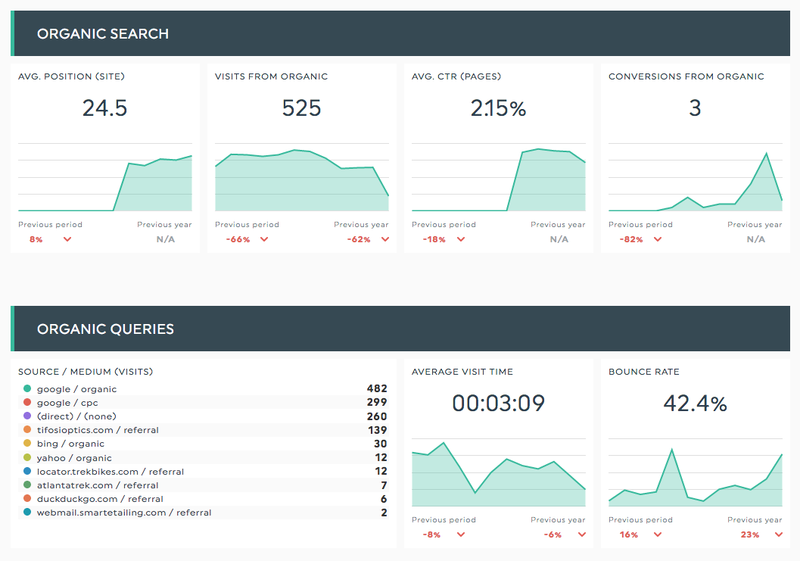 These dashboards are included at no additional cost in our Monthly SEO and Bike Marketing Services. This is our favorite part of the report. 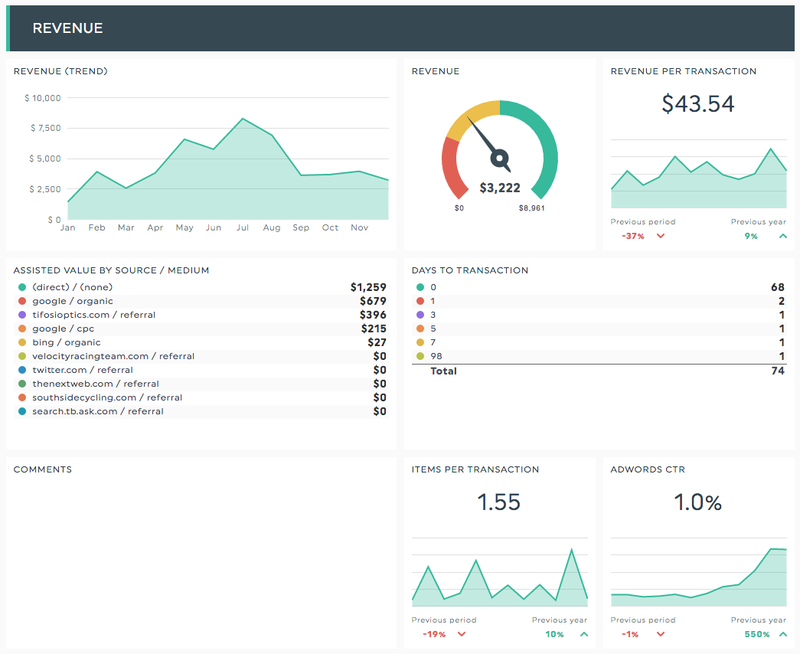 You can see some of our favorite KPIs, Average transaction value, items per transaction, revenue for the current month, revenue over time, and which sources are accounting for your revenue. 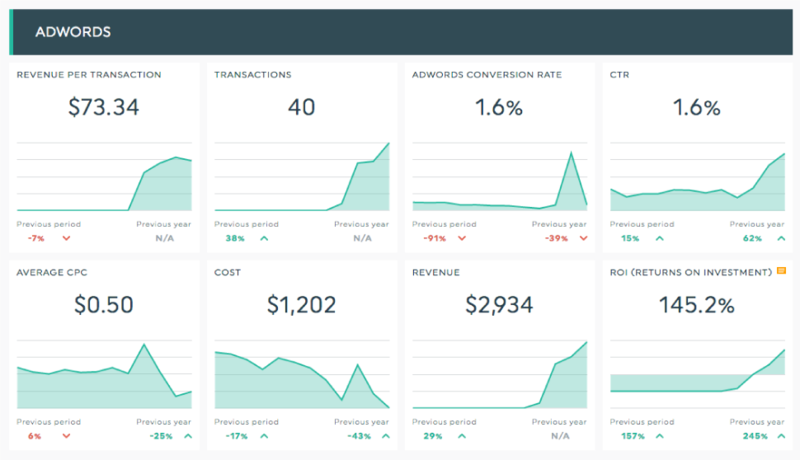 It includes your monthly Revenue, which keywords are generating the most revenue, your revenue per transaction, your average Cost Per Click, # of Clicks, your Ad spend, and most Importantly your ROI for your AdWords Campaigns. The Organic Section of the report helps you under stand how your website is performing in organic Search. Get Stoked! We can build your reports that integrate with the following services.